i had the extreme pleasure of being contacted by the lovely brooke boling, a talented photographer in Nashville, TN, to partake in an “American Honey” wedding shoot she was styling and shooting. i instantly fell in love with the theme and how she described the detail & palette and instantly knew I had to be a part of the shoot. was the shoot inspired by country music? i cannot be certain … but am surely a fan of Lady A, nonetheless. when i received the gorgeous images from brooke’s shoot, i was instantly smitten with her craft and attention to detail. i adore the tiny details and the rustic approach she took with the styling and loved seeing some of our aprons and kraft recipe cards scattered amidst the other wonderful components of this shoot. Introducing IceMilk Aprons Children’s Collection. The art of entertaining, made-from-scratch cooking and the passing down of traditions is not a thing of the past after-all. I am so thrilled to share with you the new IceMilk Aprons classic Children’s Collection of aprons – just in time for the holiday season! The holidays are a time for giving, sharing, and entertaining when family and friends come together and dust off those family recipes that make the holidays, the holidays. My sister and I were in the kitchen at such a young age with both my mother & grandmother, learning the basics of cooking and baking from scratch. I believe everyone can relate to that. The Children’s Collection compliments the look of the existing adult line, with the addition of sweet stitch detailing and pockets, perfect for busy little hands! In neutral blends of linen and cotton, the children’s aprons are rooted from classically inspired designs to be passed down for generations. With names like “cozy cupped cocoa,” “sugar cone scoops,” and “bowls of batter,” each apron was inspired by a favorite childhood memory from my childhood. And, not to worry – stories of each are to come, so stay tuned! They even come packaged in preserves jars as well, just tiny versions of the adult collection. I love the Mother + Daughter gift package for that reason – they are so sweet when paired together, and so special. I’d love to know your thoughts on the new Children’s Collection and greatly appreciate your support in helping to spread the word. IceMilk Aprons chats with Jeff Houck of the Tampa Tribune. Growing up a Florida girl (7th generation … did I mention?) you know I adore as much Florida as I can get. I am so very excited to share this article today from the Tampa Tribune entitled “Retro-style aprons coming to a modern kitchen near you.” Click here to read about how aprons are playing a meaningful role in the kitchen, with families, and on the runway today. And, of course a very special thank you to the oh-so-fabulous Jeff Houck (Facebook Page / Twitter @JeffHouck) who took the time to sit down with interest in writing this story. Be sure to check out his foodie blog over at the Tribune, The Stew. National Tie One On Day™ is today, Wednesday 11/25, Thanksgiving Eve. 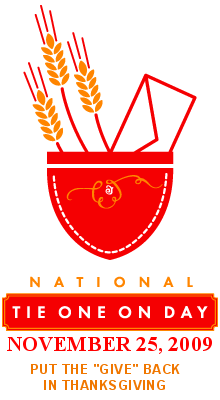 In its 4th year, National Tie One On Day is an opportunity to put a little “give” back into Thanksgiving. My dear friend, EllynAnne Geisel, author of The Apron Book, Apronisms & The Kitchen Linens Book, created this event. The event centers around wrapping a baked good in an apron, writing a note of prayer or encouragement, and tying one on…an apron, of course! and delivering the wrapped bundle to someone in need of physical or spiritual sustenance, a bit of recognition or just a kind word. Visit her website www.apronmemories.com for more information and to enter the goodie bag giveaway! Six winners!! Join us in celebrating our annual 1-day sale at IceMilk Apron – this Thursday, November 12 and receive 25% off your order by entering code: thankful at checkout! We are thrilled to carry on this tradition for another year as a birthday celebration in memory of the late inspiration and original seamstress for IceMilk Aprons – better known as Grandma! Facebook – share our 1-day promotion in your status to all your friends & family and then write on our Facebook Page wall sharing one thing you are thankful for. Blog – share our promotion or feature one of our aprons on your blog, you can email us with the link and we’ll share with all of our friends too! As wedding season gets into full swing, IceMilk Aprons provides a meaningful gift idea for brides-to-be. Amidst the wedding registries and bridal showers, a monogrammed gift provides the perfect way for new brides to celebrate their new initial. With two custom monogram styles, IceMilk Aprons allows you to mix & match to suit the new brides personal style & taste. Last but certainly not least, each IceMilk Apron comes with its own “Heirloom Kit” which includes blank recipe cards, Heritage Tag, and Apron story card. Imagine this gift coming from a new mother-in-law, welcoming the new bride the family with a stack of family recipes and a lovely new family name monogrammed apron. What a special heirloom gift to be treasured for years to come. IceMilk Aprons: At Someone’s in the Kitchen. We here at IceMilk Aprons are very proud & honored to announce that our gourmet line of heirloom aprons are now on sale in our very first retail store – Someone’s in the Kitchen in Tallahassee, Florida. This is such special news for me on so many levels, the first being that Someone’s in the Kitchen is a phenomenal kitchen & culinary shoppe that is filled to the brim with wonderful gifts for your foodie friends, for brides-to-be, or any kitchen need. The shop is so charming, located right in Market Square in the Killearn-area of Tallahassee. Robin and her simply wonderful team of lovely ladies are the best part of visiting the store. 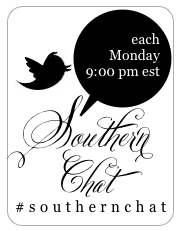 In true southern tradition you can’t help but feel a warm & genuine welcome the moment you walk in. And they have set up a lovely displaying of our aprons in the store, with some on wireforms and a stockpile of them hanging from one of the wonderful gourmet food shelf displays. And while it can’t get much better than having a darling shop like Someone’s in the Kitchen as our first signature store to carry IceMilk Aprons, it actually does! Born and raised a “Tallahassee Lassie” I spent the first 18 years of my life in the wonderful capitol city and I couldn’t be more excited to launch our line in my hometown amongst lifelong friends & family. Be sure to stop by Someone’s in the Kitchen, say hello, and check out our aprons!